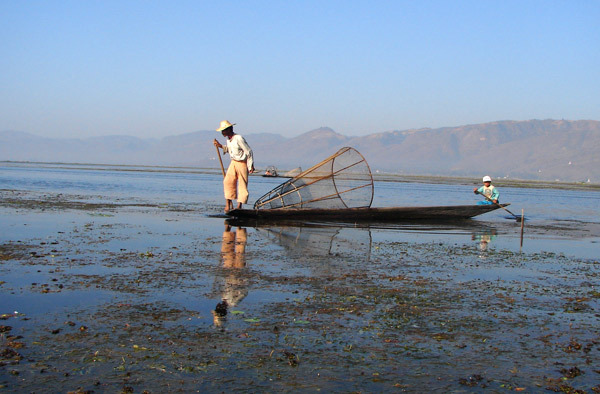 Inle Lake is the place most foreigners visit. I belive both the backpackers and the higher-end tourists feels quite comfortable here. 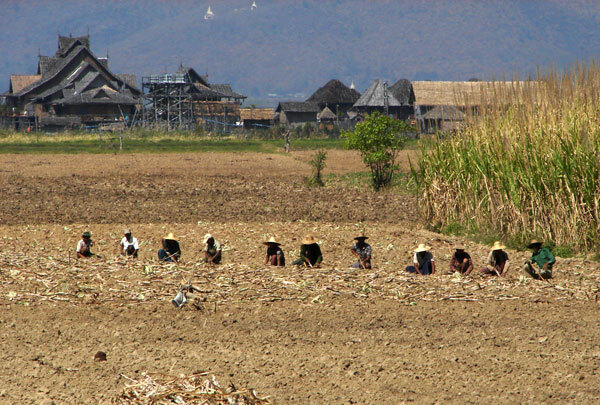 The lake is situated in the middle of the country, in the Southern Shan State. It is possible to get there by domestic flight to Heho airport or by buses. 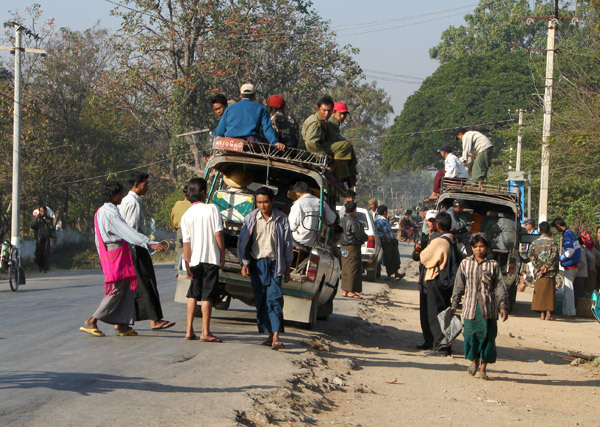 I got the bus from Yangon, 18 hour by night, whitch leaves you in Shwe Nyaung, just 10 kilometers north of the lake. 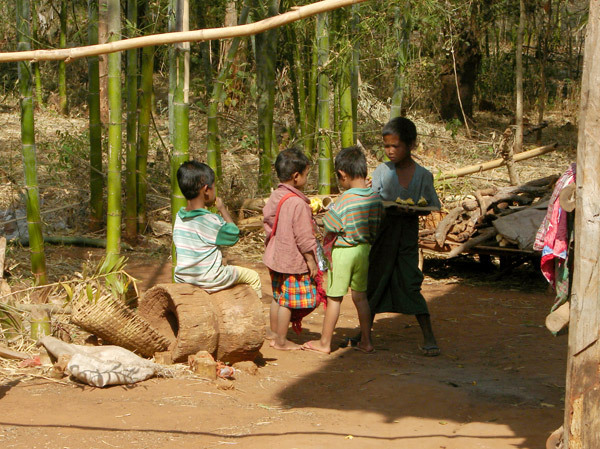 The people of Shan State claims them self that they are the friendliest people in Myanmar - and besides they've got the best weather. I actually think they're right about both of it. 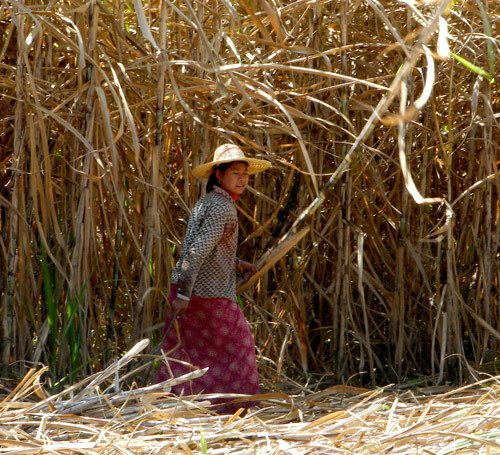 People are usually smiling and very helpful. 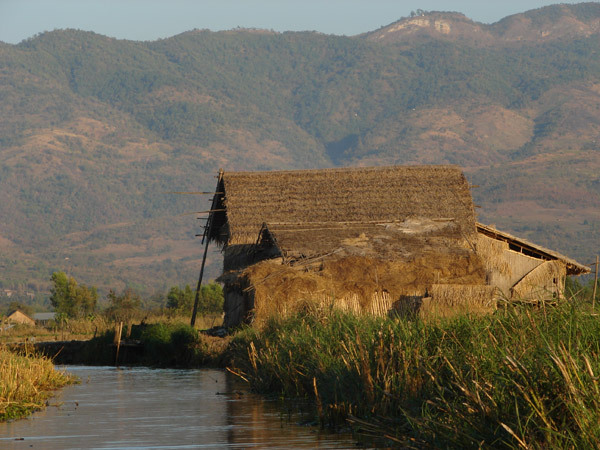 Inle lays in a mountain area at an altitude of 1300 meter, which gives hot days but cooler nights. 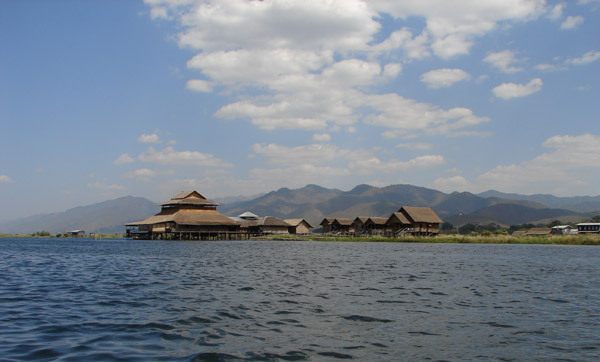 The breeze from the lake also makes the heat more endurable. 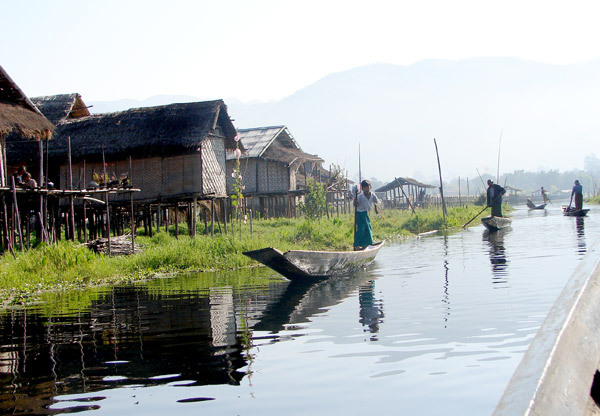 The Lake is beautifully surrounded by low mountains and all along the lakeshore lays small fisher and farmer villages. 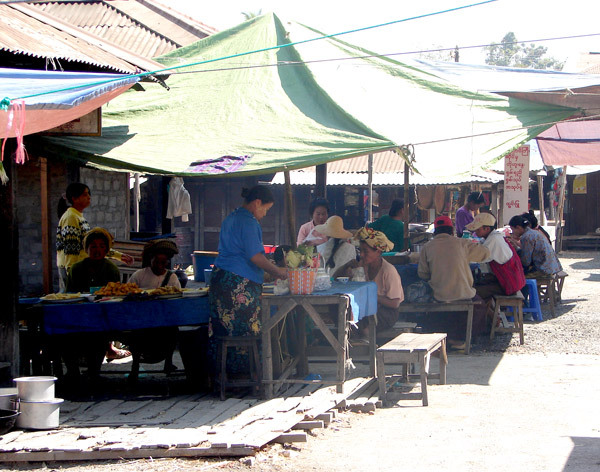 Every weekday, in a rotating scheme, there are a market in one of the villages. For the tourists, it's a must to spend one day on the lake in a motor boat. 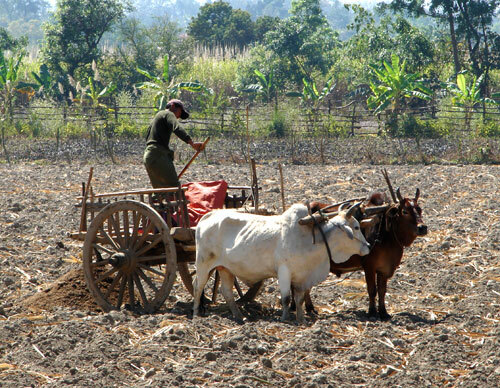 Wether you like it or not not the driver probably take you to visit the marketplace of the day, the factories and the tourist sights. And you vill watch the every day life around the lake. 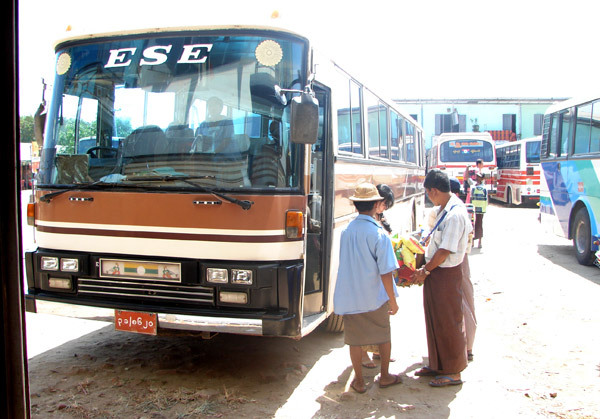 This Eastern State Express bus took me from Aungmingala bus station in Yangon to Shwe Nyaung in an 18 hour bumpy night ride. The bus station was really huge and it was easy to get lost. Besides it was far away from the inner city and I was lucky to have a driver taking me there. 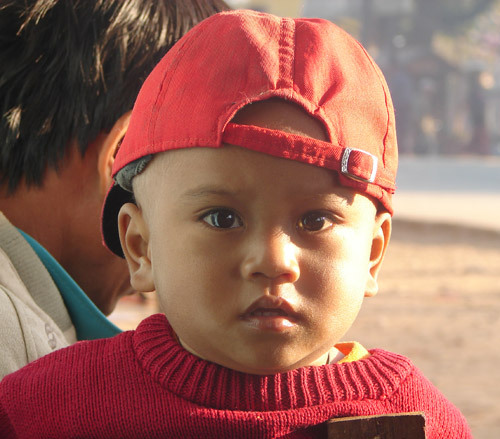 The cost was 11000 Kyat, like 11 US$. 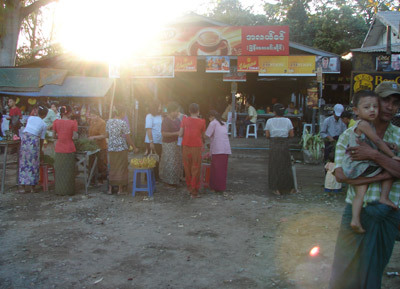 A small market at a bus stop on the way from Yangon to Inle Lake. Tea, lunch, fruit or snacks was for sale. During the night we had two lunch stops and a breakfast break. 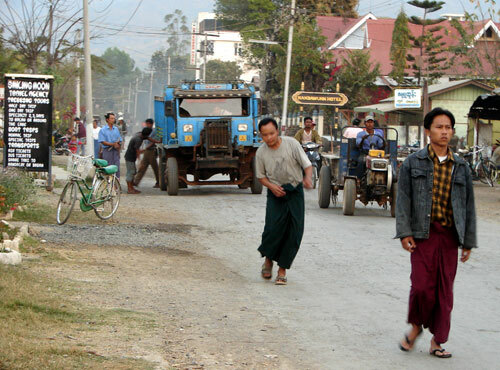 I arrived at the road crossing in Shwe Nyaung in southern Shan State at 7 am. The was a busy morning traffic. This was the the long distance bus stop. 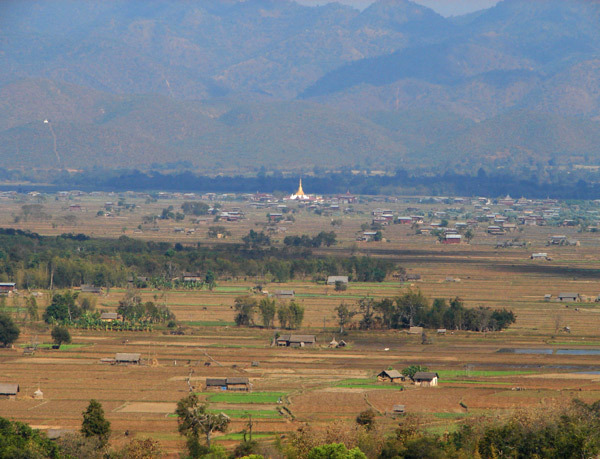 To reach Nyaung Shwe at the Inle Lake I had to go 10 kilometers south from the junction. Why doesn't this car tip over? 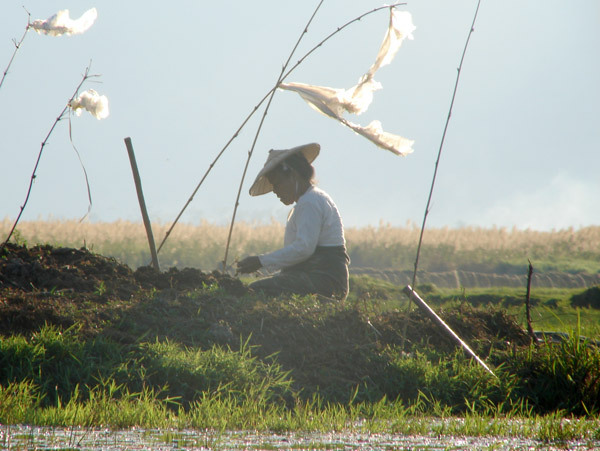 Morning view at Shwe Nyaung. 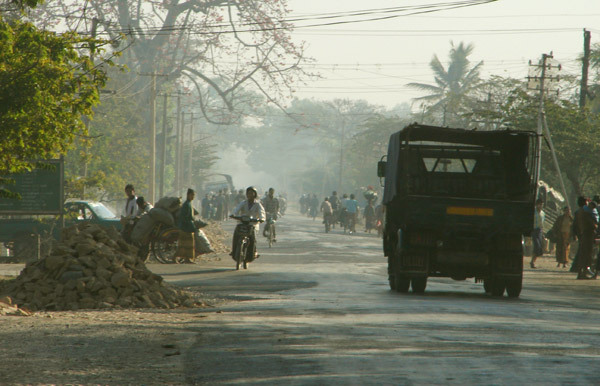 The haze still lays low over the road. 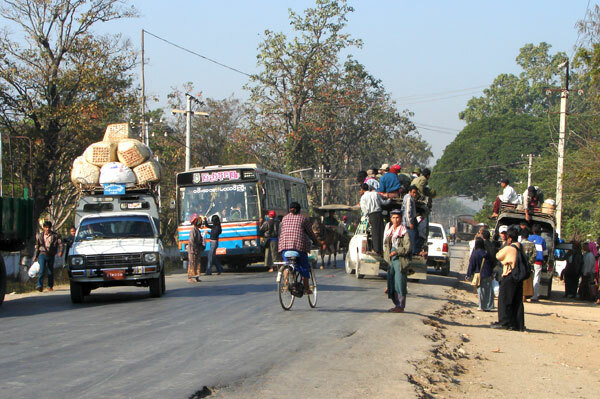 My bus to Nyaung Shwe, waiting to get filled. It was supposed to carry 20 persons, well it didn't. The ticket was 400 Kyat, 40 UScent. In meanwhile I had breakfast at the teashop. In the front is a table with i kind of fried breakfast breads. 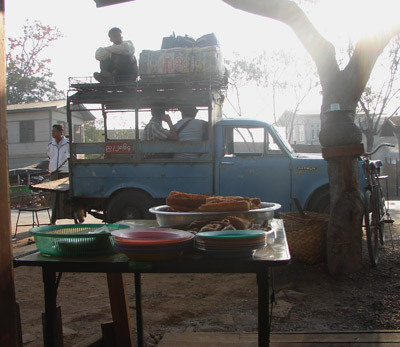 Breakfast at Shwe Nyaung. 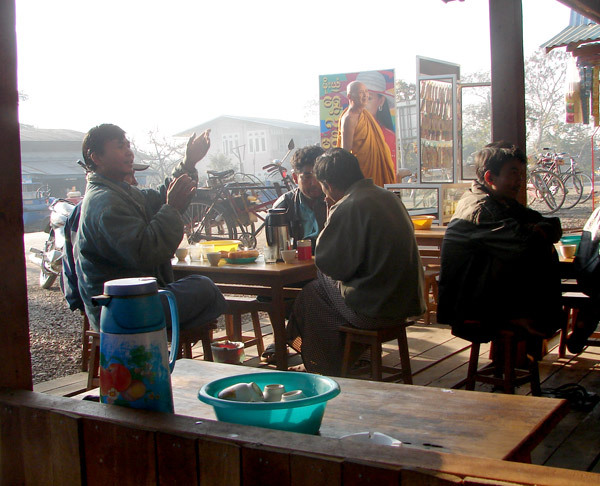 The men gathers to have a chat before going to work. In front a bottle of free green tea, drunk in small bowls. Taking care of little brother. 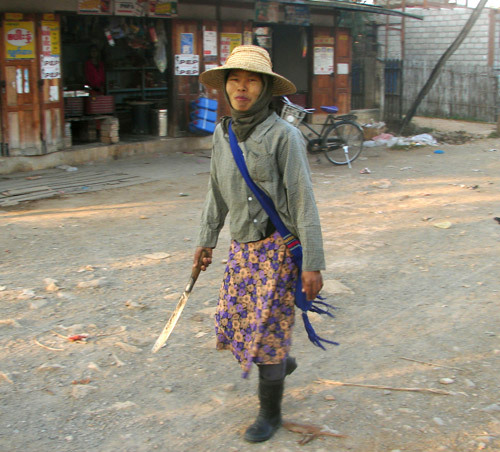 A small women with a big knife, on her way to work on the field to cut sugar canes. 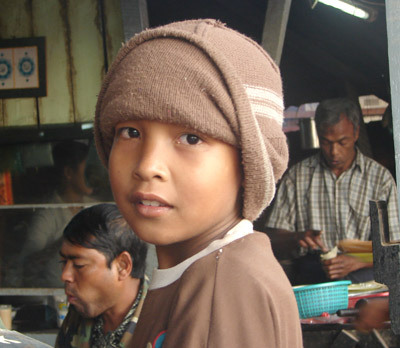 A young and cool boy at Shwe Nyaung, working at his fathers teashop. The owner himself is preparing breakfast breads to be fried in the background. 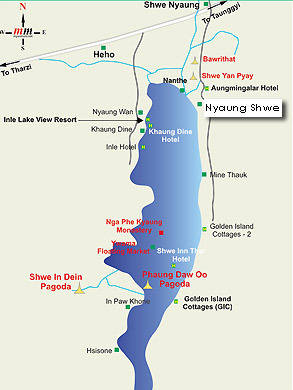 Most backpackers stays just north of the lake, in Nyaungshwe. 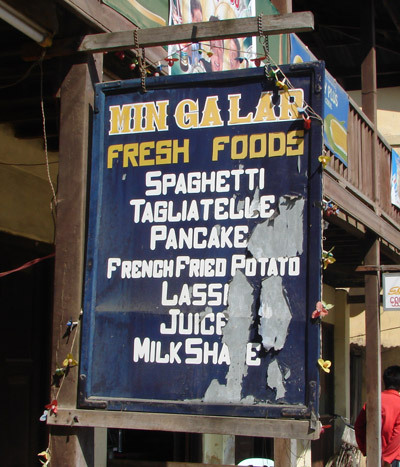 There are plenty of cheap guesthouses and all kinds off restaurants in the village. But the night life is probably not the reason you come here. 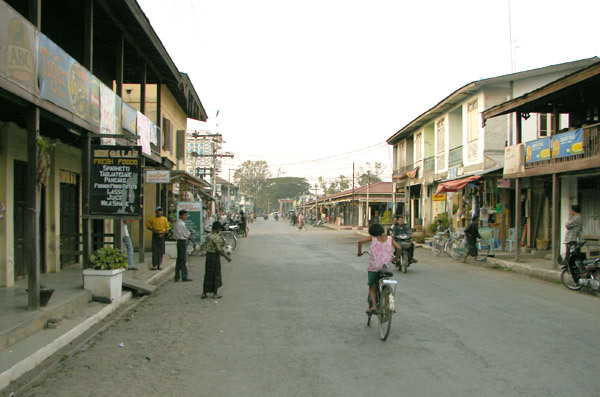 Nyaung Shwe is a really small village with only low building and very sparse traffic. 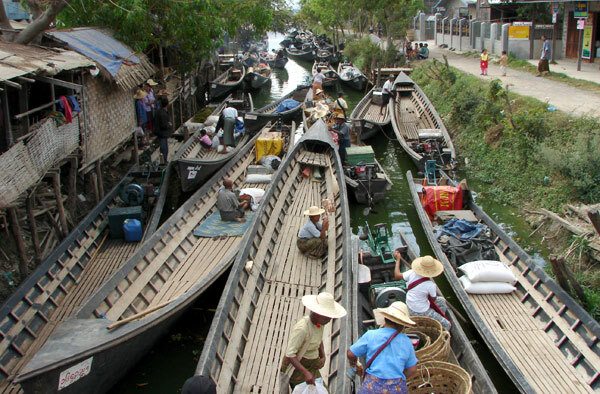 It might be a bit crowded in the canal during the market day. 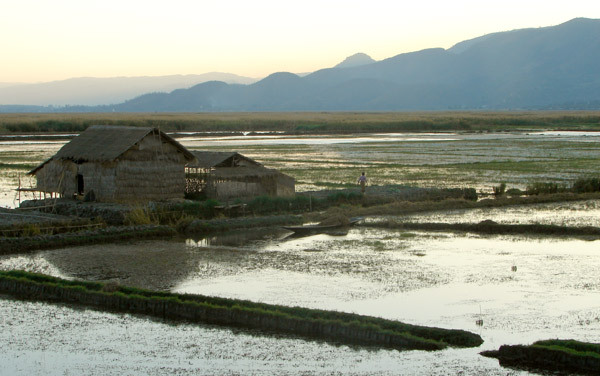 The whole lake area is dependant of the water way. Sometimes you asked your self - What's the use of traveling around the world to have a pancake or milkshake? 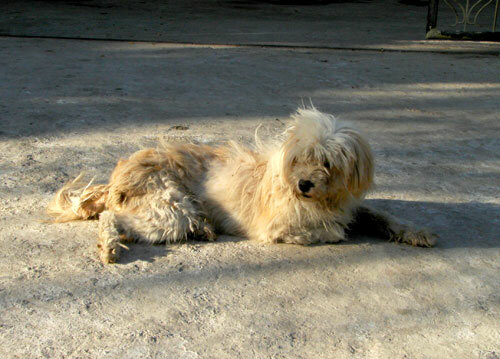 The pet dog of the hotel. There are not much of art or entertainment around the lake. 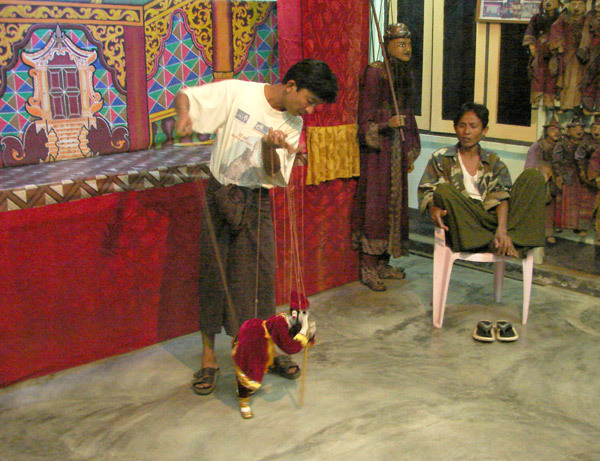 Though, there was a small puppet show in the village with its own 'puppet master'. No very exciting - I've seen impressing shows in China - but still something. It was possible to buy puppets, 5 dollars for the smaller ones I think. 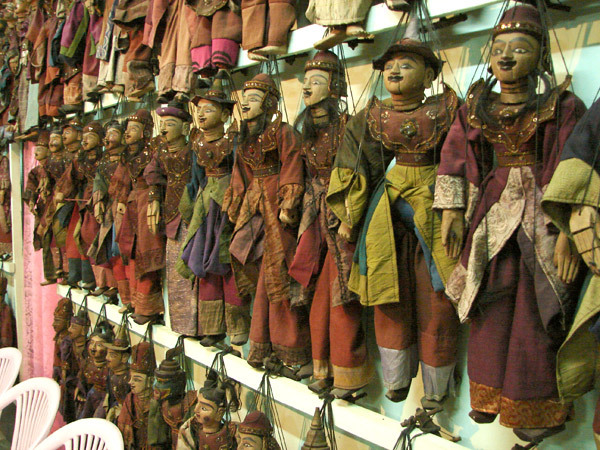 Nice collection of puppets. 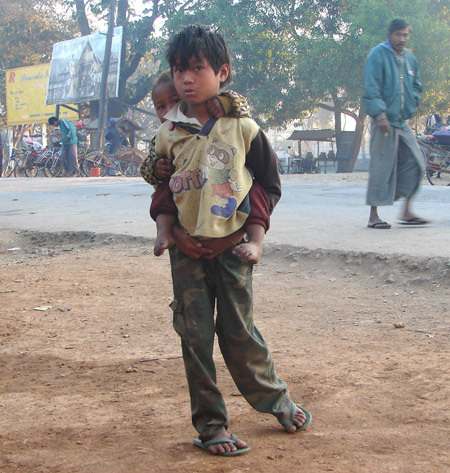 Every clothing has a different meaning, different rulers, status, social position etcetera. 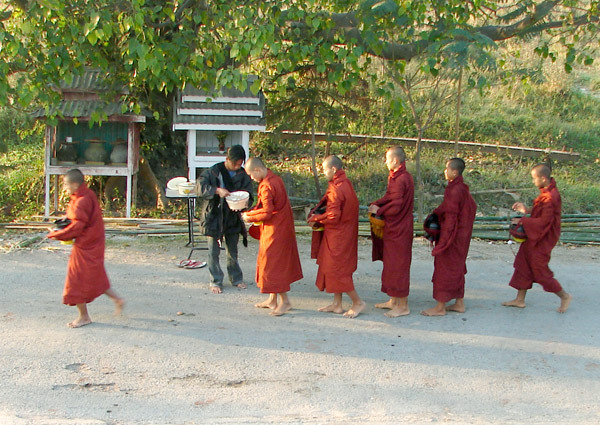 One of the younger guys of the guest house fed the monks every morning. 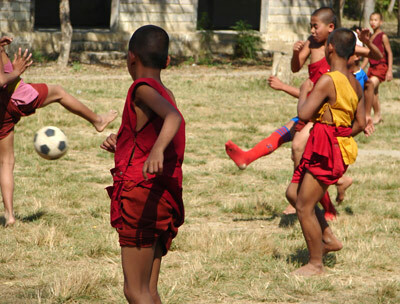 Soccer is played everywhere, even the monks couldn't keep their feets from the ball. 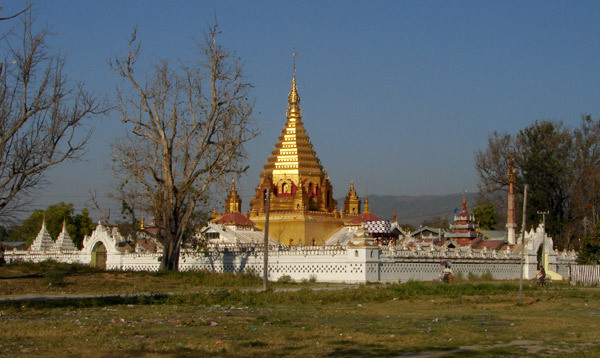 Yadana Man Aung Paya temple with its step-spired stupa in Nyaung Shwe . Another great experience I had at an Shiva festival at full moon where hundreds of Hindus gathered during the night to socializing and pay tribute to the God. 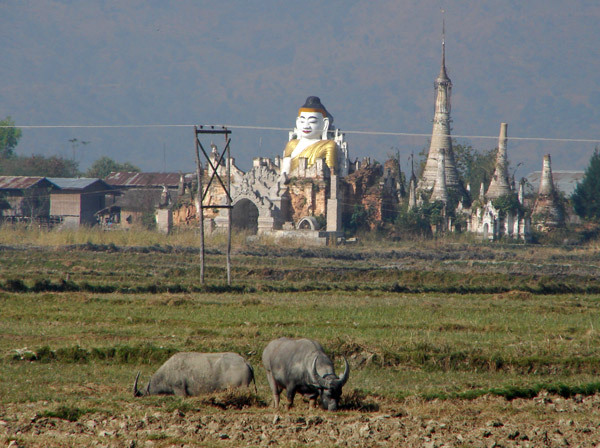 Just south of Nyaung Shwe, a giant Buddha watching over the fields, the farmers and the ox. 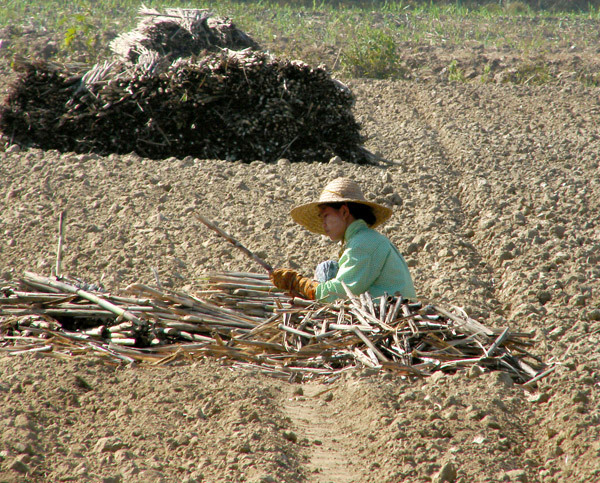 Jakes are still used for field labor. The Lake is really filled with life. 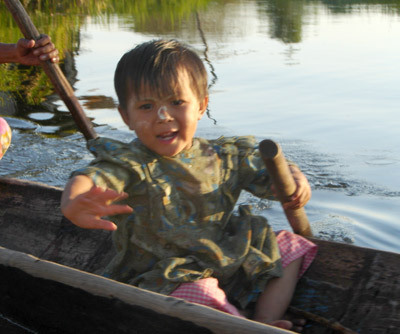 The water is used for transportation , for fishing and irrigation. There are no actual shoreline as the coast is more like a swamp. People here lives directly over the water and are dependant on boats for transportation, like a Asian Venice. The lake is surrounded by canals which brings you to small villages with houses literary built on the water. The water serves as roads here. 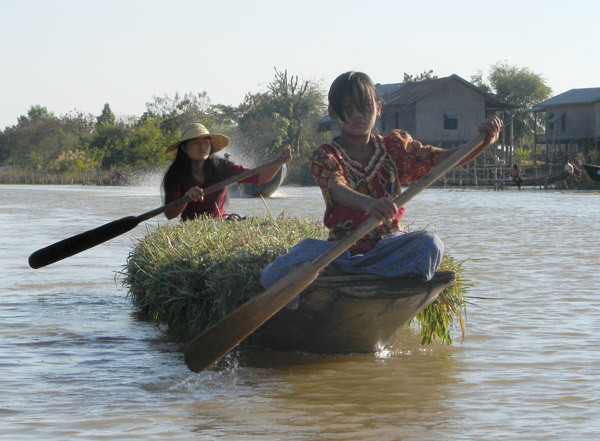 Young girls transporting seaweed in the canals the traditional way. In background a new growling motorboats. The old man showing off, demonstrating the old way of paddling with the feet, still used by fishers. In a broken language he tried to tell me about the time when British and Japanese troops were fighting just in this area. 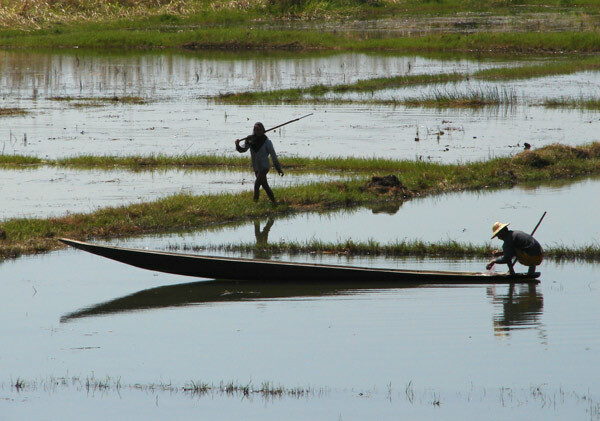 In between, the rice paddies could be used for fishing. 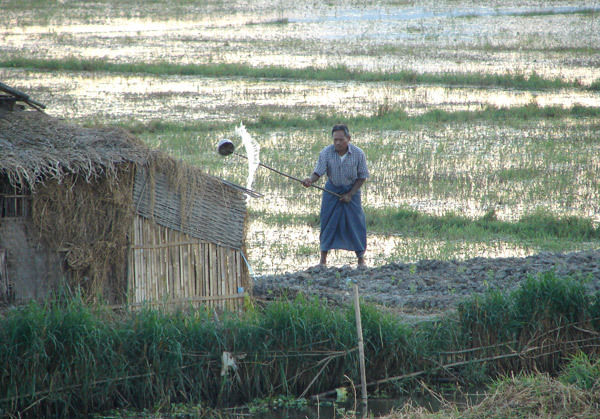 Preparing the rice field. 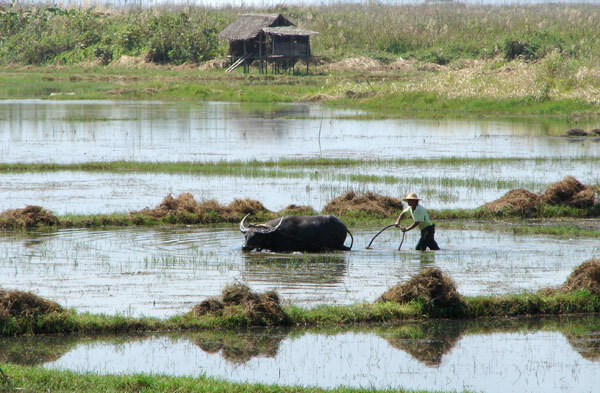 No motorized vehicle could replace the ox's work on the rice paddies. 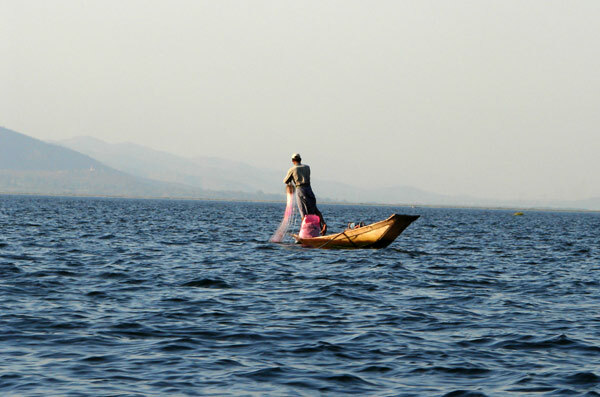 A fisher man in Inle Lake and his young assistant. 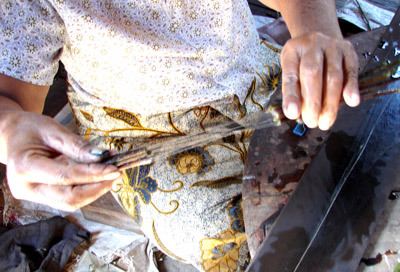 A women extracting thin fibers from a lotus root. 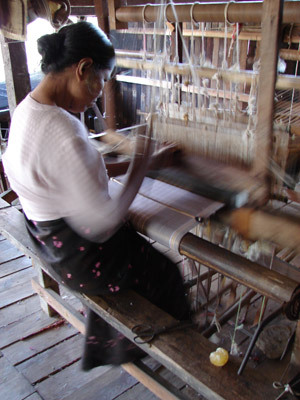 The fibers are twisted together into a thread used for weaving textiles. 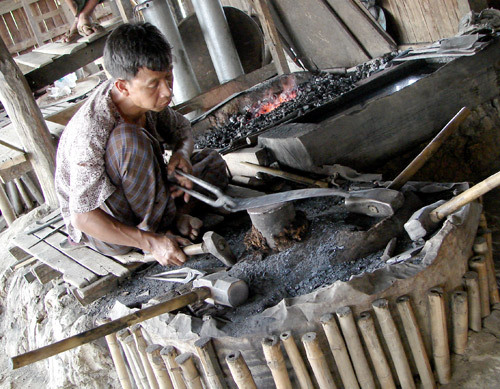 A blacksmith making a new cutting knife. 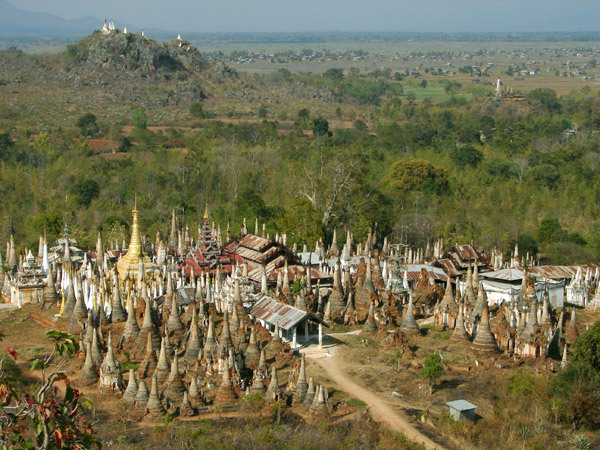 The collection of stupas at In Dein, some in ruins and some being restored. Within one eyesight you find two other holy places. Another view from In Dein. In the middle of the farmers village raises a magnificent temple. And on the other side of the lake is another one on the top of the hill. 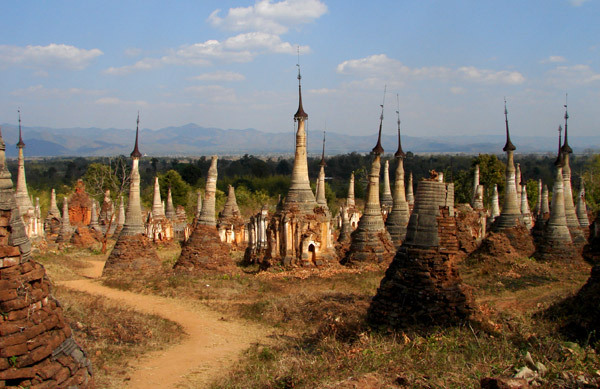 Ruins of stupas at In Dein. Isn't this a place for the next Star Wars movie to be shot? 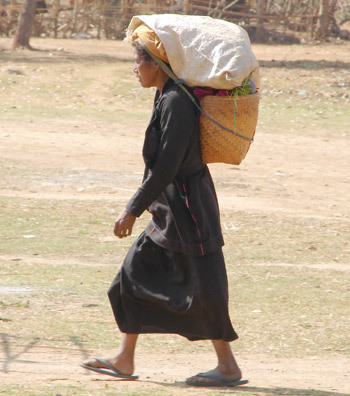 A women at In Dein, on her way home from the market. 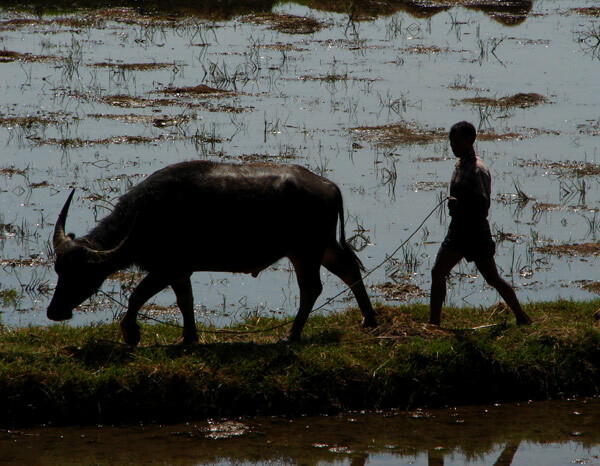 A long walk with a heavy load in the hot sun. 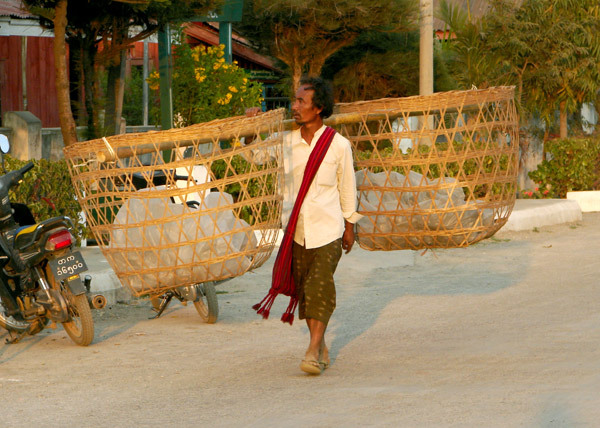 Canoes parked outside the Phaung Daw Oo Paya Temple, the holiest place in Southern Shan State. 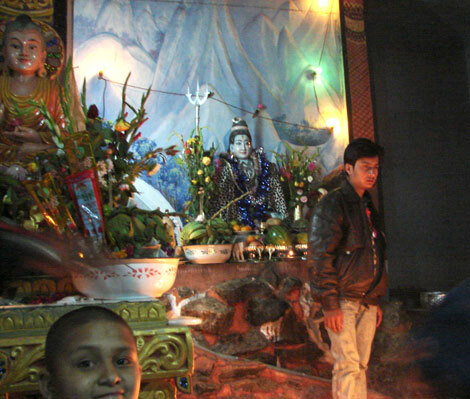 The main attraction inside the temple is not a Buddha but five holy 'images'. 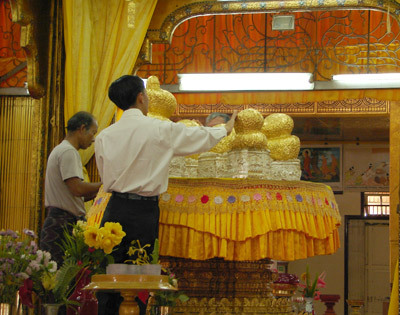 On the picture those golden stones are covered with blade gold, donated by private persons. Shoes and women are not allowed at the images. 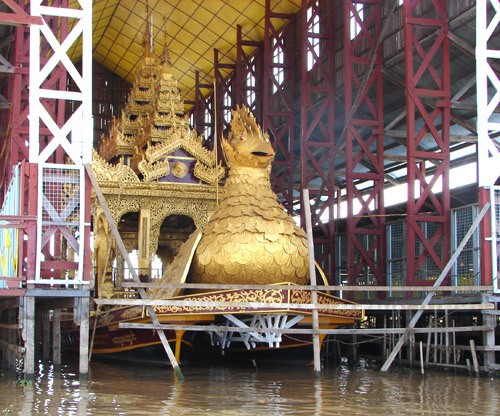 Once a year the golden 'images' at Phaung Daw Oo Paya are carried around the lake during a festival in this floating vessel.